We used dried tarragon since we couldn’t find fresh tarragon. Fresh tarragon is obviously more tastier! 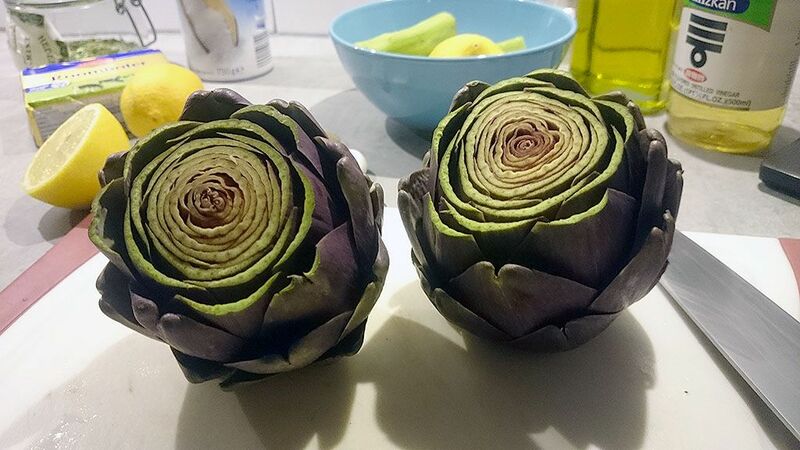 We recently bought four beautiful purple artichokes and could not wait to eat them. Preparation is super simple, it just takes a little time. Also, we learned that artichokes turn purple in the winter, and stay green in the summer! In this recipe we’re also going to show you that you can actually eat the artichoke stems, so read on! FILL the large stock pot about 3/4 with water, add in freshly ground sea salt and bring to a boil. 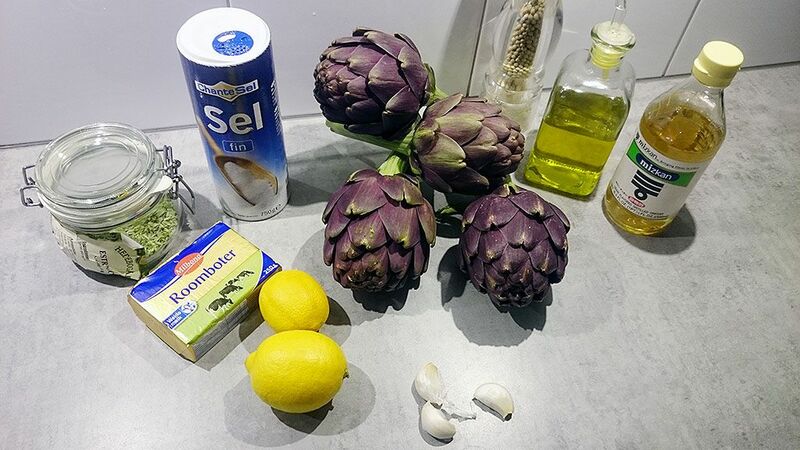 WHILE the water is starting to boil, prepare the artichokes. CUT OFF the stems from the artichoke flowers about 1/2 inch, then cut off the ‘ugly part’ of the stems. 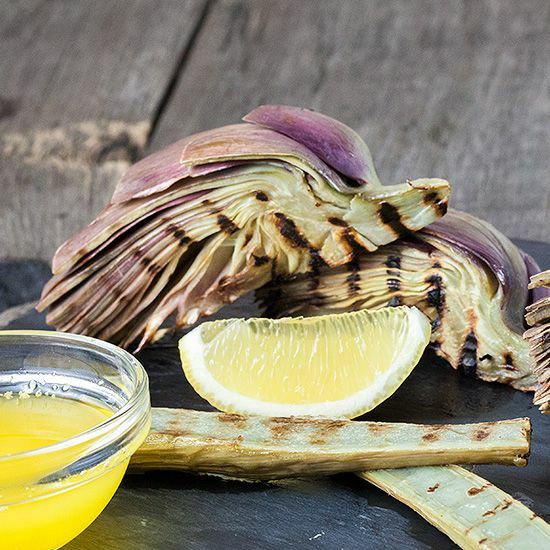 SLICE open a lemon and rub the artichoke stems with lemon juice, this will prevent them from browning quickly. TRIM the top third off the artichoke flowers (see picture below) and trim off the tips of the remaining leaves on the side. SLICE the remaining lemon into wedges and put those into the boiling water except for one lemon wedge. When the water has come to a boil, add in the artichoke hearts and stems. PLACE a large bowl on top and put something heavy in the bowl to weigh the artichokes down. They tend to float to the top, this will prevent the upper part of the artichokes from cooking evenly. COOK for 25 minutes or until you can pierce the artichoke using a skewer without any problem. MEANWHILE make the lemon butter juice. SQUEEZE juice from the remaining lemon quarter (you did save that one, right? If not, it’s okay!) and add in 3/4 cup of olive oil. WHISK in 2 tablespoons of (dried) tarragon along with the 3 crushed garlic cloves. MELT 1/2 cup butter in the small saucepan and whisk that into the bowl when melted. Set aside. DRAIN and cool upside down to get rid of all the water in a colander until cooled off enough to handle. 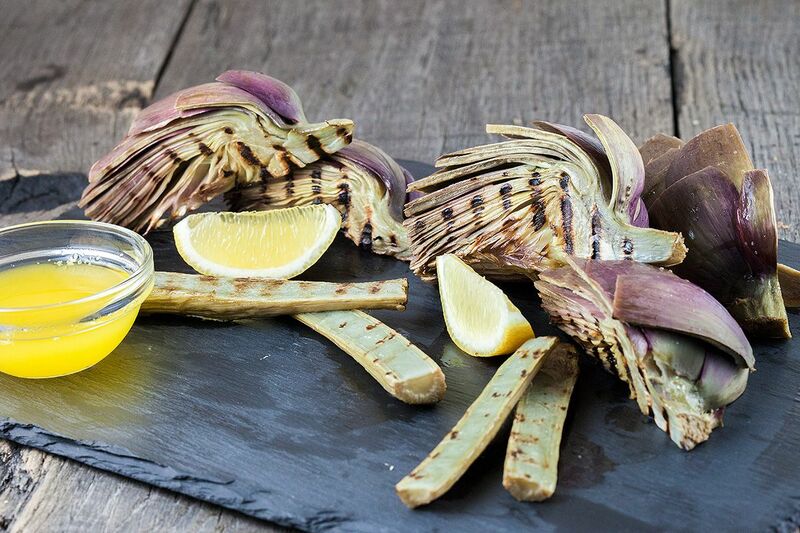 SLICE the stems in half and quarter the artichoke hearts using your chef’s knife. HEAT UP your grill pan, don’t add anything into the pan. 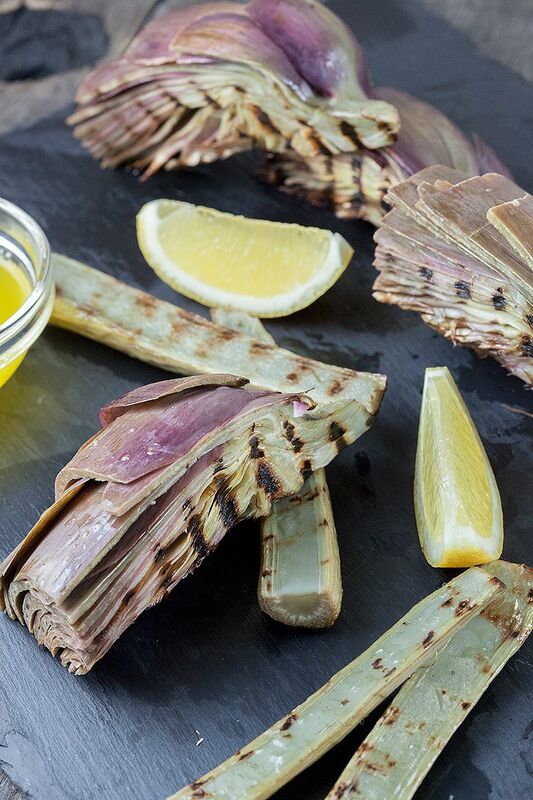 GRILL each side of the artichoke quarters until a nice grill line appears (see picture). REMOVE from the grill pan and serve 4 quarters per person along with a small bowl of lemon butter sauce. It’s best to eat these artichokes using your hands, so make sure to serve these with paper kitchen towels. Enjoy!